This crocheted up quickly and easily. I especially enjoyed it because I love the feel of cotton yarn. I love my little sunny dishcloth. This may sound goofy, but I don’t know if I will be able to actually use it. I feel like I want to keep it because to me it represents our fledgling crochet community and newfound friends. C’mon everybody! Let’s see your dishcloths! 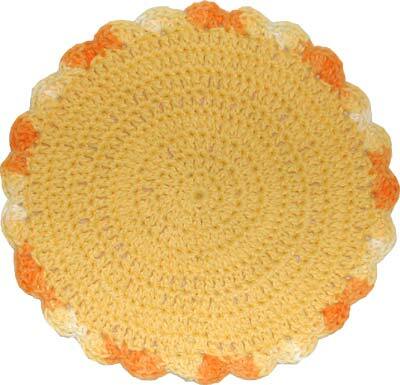 :-) Even if you don’t need a dish/wash cloth, how about making one to be a part of the crochet me Inaugural Project? You’ll zip through this fun, simple project so quickly, you’ll start thinking about making another one, I swear! Wouldn’t it be great fun to see more of these and the various colors each one of us chooses? Won’t you join in? ah ok, I just couldn’t see myself using it for the dishes… Anyway I finished and posted it over at crochetville and my site, so feel free to go have a look. Donna, I saw that you had that wonderful progress bar on your website, anychance of a tutorial, because I think it’s just spiffy! Goodie, Jen! :-) A dishcloth is something you use to wash dishes with in the States, too. A washcloth is for your face. And we put hot dishes on a hot pad. The way mine turned out (with the Peaches & Creme yarn), I think it’s too thin to reliably put hot dishes on. One could always crochet a second one and whipstitch them together for a double layer hot pad. For those who like dolls, this would make a cute doll rug. I love your dishcloth – very bright colors! I never never use a discloth to wash dishes with, but I always have one in the kitchen because I use it to wipe off the counters and table. I do also use this for a hot pad because the kitchen cotton I use is thick enough to take the heat (for small things). I’ve made smaller versions for coasters. I prefer cotton over yarn for my coasters because I find they absorb the moisture better. It looks really nice Donna. You can make it smaller with acrylic yarn for coasters, too, I’ll bet. I bought that yellow varigated yesterday. Very cheerful colors! Jen! I absolutely love your dishcloth critter, Okky in the Water!! He is too cute! What a fun modification of this project! I make my progress bars by hand in Adobe Photoshop. Do you use Photoshop? The process I go through is rather convoluted, but I’d be happy to share. you convinced me, I’m sure I won’t use a dishcloth (although I just worked out you mean something to put hot dishes on not something to wash dishes with, which is what a dishcloth is in australia) maybe I can make it into part of a toy. Thank you, Kim! Crocheting in rounds is not one of my strengths, so I was pleasantly surprised at how well this turned out.